Cathedral in the Night is an outdoor Christian community in downtown Northampton, MA which seeks to create a safe place for all people. The Cathedral community assembles every Sunday at 5:00 p.m., rain, snow, or shine, in front of First Churches at 129 Main Street. 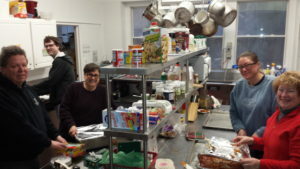 On a regular basis a team of volunteers gathers at Edwards to cook the main meal and organize sandwiches and desserts made in members’ homes and packaged for “take aways.” We bring the food and ourselves to Cathedral, becoming part of that community for worship and serving the meal that follows.